Summer to avoid snow on high passes. Accommodation open late June through to late September. 600km route over 30 days. 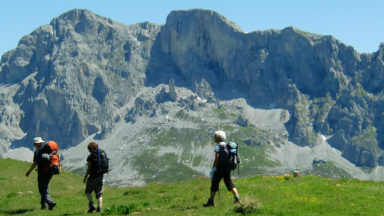 High-altitude alpine walking and simpler hill-walking. 21,000m height gain and 23,000m height loss. Simplified sketch maps and route profiles detailing each stage are included in this guide. Their purpose is to give a rough idea of the route, and to describe facilities walkers can expect to find. However, it is essential to take with you the relevant published maps. Kompass (www.kompass.at) publish two useful maps covering the whole of the E5. ‘Wanderkarte Europäischer Fernwanderweg E5‘ sheet 120 is ‘Teil Nord’ (northern part), which corresponds to Stages 1–9, while sheet 121 ‘Teil Süd’ covers Stages 10–29. At a 1:50,000 scale, they consist of strip sections of larger maps, and in combination with this guide are perfectly adequate for following the E5. Their disadvantages are occasional innaccuracies and lack of detail, and the fact that they only show the immediate area around the route; it can be frustrating not being able to identify more distant mountains. 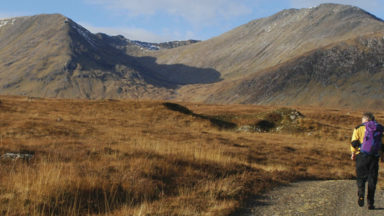 Walkers who intend to cover a short part of the route may prefer purchasing more detailed maps. Apart from Kompass, other possibilities are listed below, though there are some gaps. Leading map sellers and outdoor stores in the UK, USA and Australia generally keep these in stock. For the UK try Stanfords (www.stanfords.co.uk). Stages 1–3 1:60,000 sheet Bodensee/ Lake Constance by Kummerly+ Frey (Constance to Bregenz) www.swissmaps.ch. 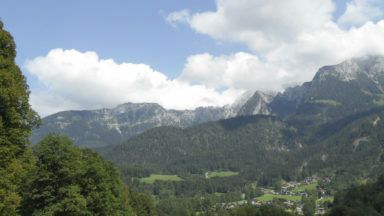 Stages 6–7 Alpenvereinskarte 1:25,000 sheet 2/1 Allgäuer-Lechtaler Alpen, West (Oberstdorf to Holzgau only). Published by the Austrian Alpine Club; members can order the map at www.alpenverein.at/karten. members can order the map at www.alpenverein.at/karten. Stages 11–13 Tabacco 1:25,000 sheet 039 ‘Val Passiria/Passeiertal’ (Zwieselstein to Hirzerhütte). Stage 14 Tabacco 1:25,000 sheet 011 ‘Merano e dintorni/Meran und Umgebung’ (Hirzerhütte to Meranerhütte). sheet 034 ‘Bolzano-Renon-Tschögglberg’ (St Jakob to Deutschnofen only). Stage 16 Tabacco 1:25,000 sheet 029 ‘Sciliar/Schlern’ (Bozen to Oberraden). Stages 23–24 Sezioni Vicentine del CAI 1:25,000 sheet 2 (foglio nord) ‘Sentieri Pasubio Carega’ (Passo Coe to Pian delle Fugazze). Stages 25–27 Sezioni Vicentine del CAI 1:25,000 sheet 1 (foglio sud) ‘Sentieri Pasubio Carega’ (Pian delle Fugazze to Maregge only). Stage 29 Provincia di Verona-Comune di Verona 1:20,000 ‘Carta dei Sentieri Sulle Colline di Verona’ (Montecchio to Verona). So far as I could tell the E5 is now signposted locally over the Rettenbachjoch rather than the Pitztaler Jochl, as shown on the Kompass map – or at least if there were E5 signs to the Pitztaler Jochl I didn’t see them. There is still snow to descend on the other side! Local waymarking and the Kompass map both avoid the centre of St Leonhard (I think in order to go via the museum). Again that seemed a shame - I followed the Guide through the village centre and had a pleasant stop at a cafe in the square. On page 114 the route from Passo del Redibus to Palu del Fersina (not Palu "di" Fersina) is signposted via a route that rises from the pass and then descends to the village rather than just following the road, as shown on the Kompass map. I just walked down the road per the Guide - the diversion seemed to be an attempt to add unnecessary "interest" to a short and purely functional stretch at the expense of unwelcome height gain. Contrary to what a previous Website update suggested, the routing via Passo Portella and Monte Gronlait is still waymarked on fairly new signs and seems to be the principal approved route. Navigation from Levico through Quaere to the start of the ascent to Baita Cangi was devilish in the extreme. I didn't see some of the signage mentioned in the Guide - it may have gone. The trick was to bear almost continuously right on a generally easterly heading after the T junction at Quaere. However until (with relief) I found my first signpost to Baita Cangi after a sharp right turn I wasn't sure if I was in the right place at all. The Kompass map shows the route accurately. For some reason the Kompass map takes a wholly different (and much longer) route from Carbonare to Passo Coe, coinciding with the Guide's route only at Forte Cherle. I can’t see why it does this. Waymarking on the ground (albeit very sparse in places) is per the Guide. Waymarking on the ground now goes OVER Cima Palon, as shown on the Kompass map, along to the pass at the end of the ridge, then drops to Rif Papa (i.e. avoiding Seletta Comando). Stage 16: the E5 has reportedly been rerouted via Laneralm to the Bletterbach Visitor Centre then the botttom of the gorge and up the other side. p118 the E5 has reportedly been rerouted via Val Cava. It joins a road after 40min then after 4km reaches La Bassa and the route described in the guide - see p120. Stage 4: Between Lingenau and the German border there is little mention of E5. If using a high level route to the Staufner Haus there is a Jausen station, Johannis Alm, at the junction of paths 164 (starts at the toll) and 163 (to Platten Alm). Stage 5: Stuiben–Steineberg section has the most serious technical vf stretches. There is now a ca. 10m vertical ladder descent direct from the Steineberg cross to pick up the E5 route. This saves doubling back to the junction at the true summit, but could be a bit daunting. Alternatively there is a path S. From the cross past Grathofle Alpe to a vehicle track which rejoins the E5 just above Durrenhorn. Stage 6: There is now a bus service from Oberstdorf Station to Spielsmannsau. Stage 8: Oberloch Alm is basic but functions. 45 minutes later the Unterloch Alm is also in business and very popular. Stage 9: There is now an ultra-modern hut with accommodation + meals at the top of the Venetbahn www.venet.at tel (43) 5442 62663. Stage 10: The frequent Rettenbach bus service will stop at the Rettenbachalm allowing a swift descent down the awful Rettenbachtal. Stage 11: Both Moos and Pfandleralm can get fully booked. Rabenstein and Hasselstaude (Stage 12) provide an alternative combination. Stage 12: Jausen Pfeiftal now offers accommodation tel 0473 641288 www.pfeiftal.it. A short descent away is Gasthof Haselstaude www.haselstaude.it tel 0473 641248. Stage 16: Wolfstal Alm is no longer a Jausenstation. 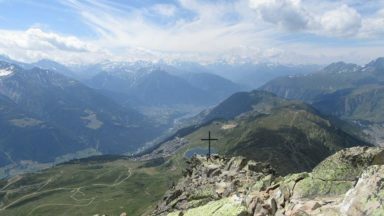 Stage 18: apart from Rifugio Potzmauer at the pass, there are no other refuges until Lago Santo. Stage 19: The W end of Faver has a new road, roundabout, flyover and tunnel, plus a left turn to Ponciach. Avoid them all by sticking to the right edge and go through Faver as before to the left turn to Ponciach. Stage 22: This area was hit by a localised tornado and the paths have not been fully restored.Stage 24: A summer bus from Pian delle Fugazze goes to Rifugio Campogrosso. Page 116: Rifugio Lago Erdemolo is closed at present. 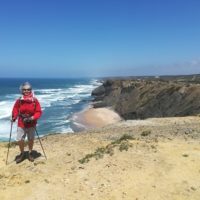 'This is the first detailed guide in English to a relatively unknown European long-distance route. Beginning at Lake Constance in Germany, the trail passes through low-level Switzerland and rural Bavaria before traversing Austria's Otztaler Alps and heading south to Italy's mountainous Trentino region, finishing at Verona. 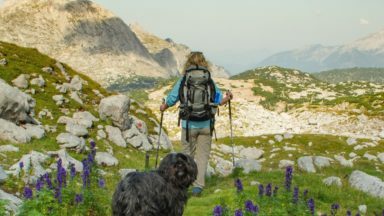 'This is the first English-language guide to a north/south trans-alpine route and is a logical extension for Gillian Price to her excellent series of guidebooks to the Dolomites and Northern Italy. 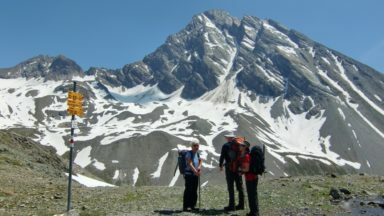 Essentially, it is an alpine route, though it includes suitable walking for all abilities. The excellent introduction provides general background information, a selection of shorter trips and it lists support facilities including maps, transport and accommodation websites.